With over 60% of Americans now having Internet access and 40% of Americans having been online for more than three years, the Internet has become a mainstream information tool. Its popularity and dependability have raised all Americans’ expectations about the information and services available online. When they are thinking about health care information, services from government agencies, news, and commerce, about two-thirds of all Americans say that they expect to be able to find such information on the Web. Internet users are more likely than non-users to have high expectations of what will be available online, and yet even 40% of people who are not Internet users say they expect the Web to have information and services in these essential online arenas. Internet users are very likely to say that they expect the Web to be a source of information on health care, government agencies, news, and shopping. About 80% of Internet users say they expect the Web to have information in these topic areas. These high expectations are driven by experience. 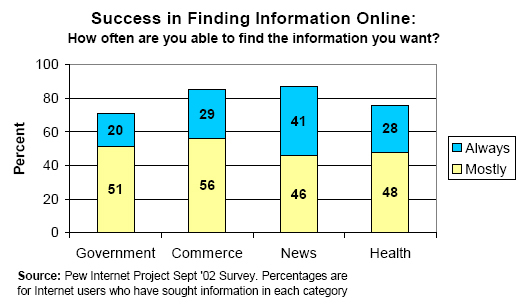 Of Internet users who have sought information from the Web on these topics, about three-fourths have had positive experiences in finding what they need. For many of these Internet users, the Net is the first place to which they will turn next time they need information about a government service or health care. For information or services from a government agency, 65% of all Americans expect the Web to have that information; 82% of Internet users say this and 39% of non-users say this. In the realm of electronic commerce, 63% of all Americans expect that a business will have a Web site that gives them information about a product they are considering buying. Four out of five (79%) of Internet users say this and 38% of non-users say this. For news, 69% of Americans expect to be able to find reliable, up-to-date news online; 85% of Internet users say this, compared with 43% of non-Internet users. For health care information, 67% of Americans expect that they can find reliable information about health or medical conditions online; 81% of Internet users say this versus 45% of non-Internet users. Overall, 84% of all Americans have an expectation of finding information online in at least one of these four topical areas. That translates into nearly all Internet users (97%) and most non-Internet users (64%). When it comes to personal information, the story is different. Only 31% of Americans expect to be able to find reliable information about someone online; 35% of Internet users say this and 25% of non-users say this. However, 58% of Internet users say they expect to be able to reach someone via email. In looking at how successful Internet users have been in finding the information they need online, the following chart shows how Internet users fare when they go online to satisfy information needs. Most of the time searchers in these categories find what they want—more than 70% in all categories. For news, 41% of online news hounds say they always find what they want on the Net. There is also abundant evidence that the Internet is now the primary means by which many people get key information. When asked where they will go for information the next time they need information about government or a service it provides, 58% of Internet users say they will go online next time they need government information; this compares will 28% who say they will use the telephone. When all Americans are asked this, 39% of all American say they will go online. This is about the same share (37%) that says they will call. When asked where they will go for information the next time they need health or medical information, Internet users are about as likely to say they will turn to the Internet for information as they are to contact a medical professional; 46% say they will find health care information online next time they need it and 47% say they will contact a medical professional. Overall, 31% of all Americans say they will find it online, while 59% say they will contact a medical professional. For business, it is clear that an online presence is important, regardless of whether a business actually sells its wares over the Internet. If a store provides product information online, even if it doesn’t sell products at its Web site, nearly half of all Americans (46%) said this would make them more likely to go to the physical store to buy the product. About the same number (45%) said it would make no difference, and these numbers were the same for Internet users and non-users alike.